Portobello Mushroom Burgers – Voila! Ahhh summer! Nothing like grilling (inside) on a summer night. We live in an apartment with no patio, so an indoor grill will have to do – and it did! These portobello burgers are layered with: sauteed spinach, grilled red onion, sundried tomatoes, homemade garlic aioli and of course, a portobello mushroom. It wasn’t complete without a few side items: namely, corn on the cob and mashed potatoes. The making of these mashed potatoes is what you might call rapid prototyping. I had three types of potatoes that all needed to be cooked ASAP. I didn’t have milk, cream or sour cream (the almond milk in our fridge wouldn’t cut it), so I used nonfat greek yogurt, olive oil, roasted garlic, salt and pepper. The bomb! (Yes I grew up in the 90s). 2. Sauté the baby spinach in olive oil and a sprinkle of salt in a large sauté pan on medium high heat, just until the spinach wilts, then remove to a plate. 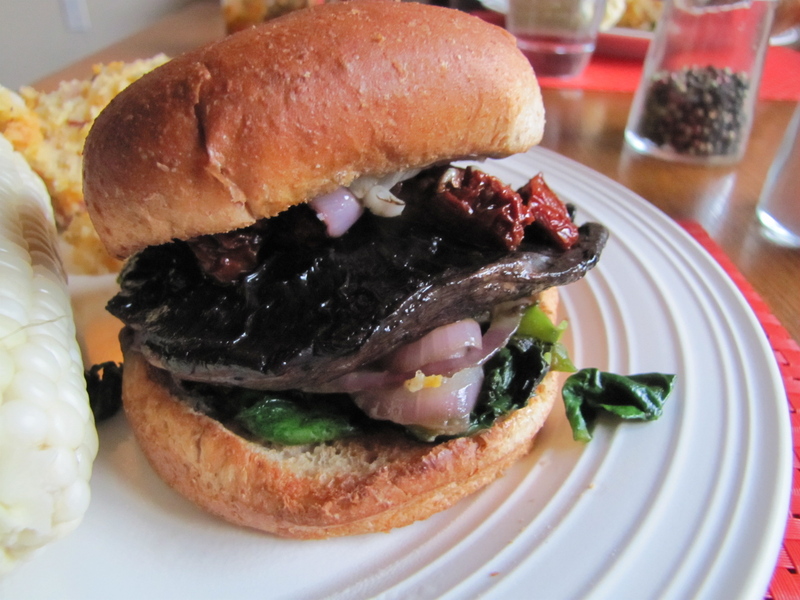 The gently wilted spinach will stay on the portobello mushroom burger better than raw spinach, which tends to fall off. 3. Wipe the mushrooms clean with a damp paper towel. If you are working with whole mushrooms, slice off the stems. Paint the tops of the mushroom caps with some of the oil from the sun-dried tomatoes. 4. Scrape the grill grates clean. Using a folded up paper towel dipped in sun dried tomato olive oil, wipe down the grill grates to oil them. 5. Brush the onion rounds with some olive oil and place them on the grill. Place the mushroom caps on the grill, top side down first. Grill the mushroom caps and the onion rounds for 3-5 minutes per side. Grill the burger buns (or broil them in the oven), cut side down, for about 1/2 to 1 minute, until lightly toasted. 6. To assemble, layer spinach, onions, portobello then sun dried tomato. Serve at immediately.